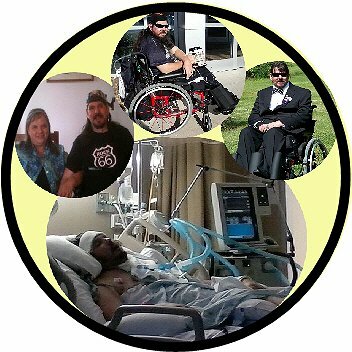 Family and friends of John Anson are raising money for the nonprofit Help Hope Live to fund a handicap wheelchair accessible van, medical expenses associated with Catastrophic Injury (John’s paraplegia) and Catastrophic Illness, like John’s hospitalization for 7 1/2 months from December 31, 2017 to August 8, 2018 for complete respiratory failure from pneumonia that was not covered by his pneumonia shot, collapsed right lung, and a blot clot in his right arm from a blown mid-line IV used for antibiotics. He was in a coma for 6 months of that 7 1/2 month hospital stay. Then John was home for eight days and had to have emergency surgery on his bladder. That hospital stay was from August 16th to 21st, 2018. John is home hospital bed bound with several medical equipment machines he requires to breathe and is working with home nurses and home physical therapist getting his strength back and working on being able to use his slide board to transfer in and out of his wheelchair. Help Hope Live fundraising also helps with medical expenses that go beyond what John’s health insurance pays or does not cover, like the handicap wheelchair accessible van and travel to and from treatments and appointments. John has chosen to fund raise for Help Hope Live in part because Help Hope Live assures fiscal accountability of funds raised and tax deductibility for contributors. Contributors can be sure donations will be used to pay or reimburse catastrophic injury, catastrophic illness, handicap wheelchair accessible van, home health medical equipment that insurance does not cover or goes beyond what insurance does cover and related expenses. John’s greatest need is to replace his handicap wheelchair van that had over 300,000 miles on it and 2 years ago on December 19, 2016 the electrical burned up and van had to be taken to salvage yard. John is a paraplegic (paralyzed from the waist down) from a severe spinal cord injury which caused Hemorrhagic Infarction (severe bleeding) within the spinal cord leading to Myelomalacia, which is the permanent softening of the whole spinal cord (soft like a wet sponge) caused by intervertebral disc extrusion (being forced or pressed out) from a catastrophic spinal cord injury. John has been paralyzed since latter part of 2000. In 2012 John had to have his left hip socket removed. John’s other health issues include seizures, DVT in his paralyzed legs and he is on blood thinners for the DVT. The blood thinners make him susceptible to pulmonary embolisms or bleed outs so his blood is checked every couple of days by a machine that checks his blood thickness (INR rate) and his blood thinner medication is adjusted by the Coumadin Clinic after each test. John also suffers from advanced stage COPD with emphysema and is on oxygen 24/7, has twice daily SmartVest chest percussion therapy (CPT), nebulizer breathing treatments 4 times per day, and three inhalers. John’s lung specialist has ordered a cough assist machine to add to his home health medical equipment. John has ongoing chronic pain, migraines, and has a colostomy bag and a suprapubic catheter (which makes him susceptible to UTIs). He had 7 polyps removed from his colon in November of 2014 and biopsy done for cancer that came back benign and no cancer – Praise the Lord! There are constant smaller medical issues that come up that are all part of John being a paraplegic and his other major health issues. Ann is John’s wife and main caregiver with home health care assistance consisting of: 1) RN nurses in three days a week and on call 24/7 for emergencies; 2) one PCA for 12 hours a week that helps with meal prep, laundry, light housekeeping, shopping, picking up prescriptions, and errands; and 3) two CNAs twice a week to help with John’s bed baths when he is bedridden (recovery after a hospital stay or surgery) and showers when John is not bedridden in his hospital bed. We would truly appreciate your prayers, support and donations to help defray John’s medical expenses that are not covered by health insurance. To make a tax-deductible donation to this fundraising campaign in John Anson’s name, click on the Give button.